A Team of Russian Physicists from ITMO University have discovered that spherical silicon nanoparticles can be effectively heated up and concurrently produce light based on their temperature. According to the Researchers, these properties united with a good biocompatibility will facilitate usage of the semiconductor nanoparticles in nanosurgery and photothermal therapy. The Researchers plan to manipulate the heating of the silicon particles in the future to internally burn cancer cells without affecting healthy tissue. The research findings have been published in the prestigious journal Nano Letters. Doctors inject nanoparticles of biocompatible metals, such as gold, into a human body when executing photothermal therapy and nanosurgery. They concentrate the nanoparticles on a tumor and irradiate them with a laser. Biological tissues are transparent for infrared light, but metal nanoparticles absorb it well and change it into heat that burns cancer cells. However, measuring a local temperature of gold nanoparticles is a very tough task that, if not correctly done, could result in overheating and damage of healthy tissue. Scientists continue hunting for biocompatible substances that are able to heat up and simultaneously inform about their temperature. The Physicists from ITMO University have found such a substance in silicon. 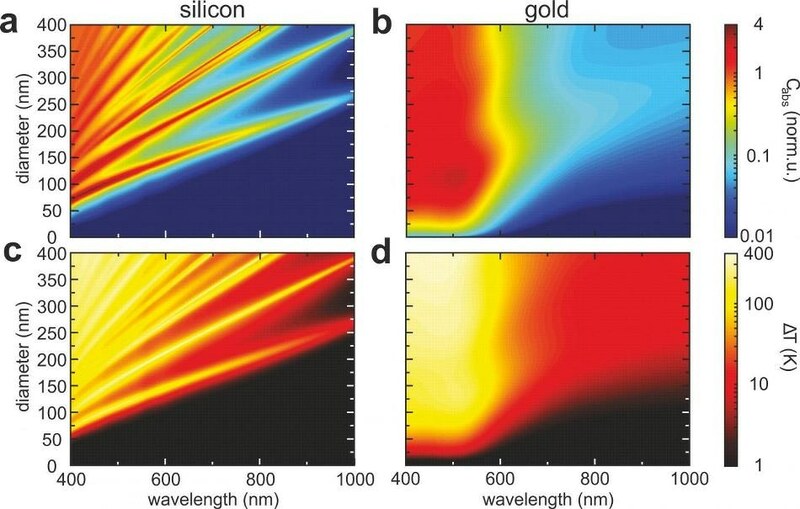 As the latest study reveals, resonant silicon nanoparticles are heated up even quicker than golden ones as a result of the better resonant properties and, in contrast, can signal regarding their temperature by scattering light with varying wavelengths. Such scattering effect is referred to in optics as Raman scattering. Furthermore, this optical reaction can be registered without vacuum systems or complex devices that are required to trap signals from metals. Golden nanoparticles are widely used in photothermal therapy, photochemistry and nanosurgery. But the optical response of such agents does not give information about how much they are heated, because metals never re-emit Raman light signal. At the same time, it was known that silicon has an optical response that strongly changes with temperature. But no one imagined that a silicon nanoparticle can be used as an efficient heater, since it has significantly less optical losses than gold. Recognizing that the optical reaction of silicon strongly relies on temperature and that this material is biocompatible, the Researchers tested how effectively the nanoparticles are heated up and how accurately one can register their temperature. The Researchers raised the temperature of silicon nanoparticles lighting them with laser and recorded the discharged Raman signal, which allowed concurrent temperature detection. In the meantime, contrary to the golden nanospheres, the tested silicon particles were four times more efficient in changing laser radiation into heat. This would allow changing the nanoparticles' temperature using a less powerful laser beam without heating adjacent healthy tissue. The Researchers trust that the semiconductor nanoparticles can be an inexpensive and safer substitute to metal.